Kyocera FS-C5200DN Expert Reviews - Read Reviews and Buy Smarter Online. Verdict: Kyocera Mita markets its FS-C5200DN as a small workgroup colour laser printer, but if you add all the expansion options, it looks as if it could deal with quite a large workgroup. 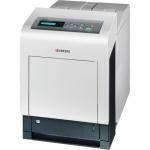 It has the paper capacity, speed and high-yield consumables to give it a very reasonable Total Cost of Ownership (TCO).